Yet again, journalists aid the politically powerful in foisting deceitful claims on the public by concealing the truth behind a wall of secrecy. Here’s the problem, though. Sources request "background" or "off the record" status at the beginning of a conversation—that is, before you know what they’re going to say. Maybe they’re just going to give you spin, and maybe they’re going to tell you something that would get them in hot water with an employer or colleague if it were attributed. When you’ve got a relationship with a source over time, of course, you can start being a bit more demanding with the folks who request anonymity for spin. But in a given instance, you don’t know which it is until you hear what they’ve got to say, which often requires agreeing to a source’s terms—at which point you can’t go back on the agreement if they’re just giving you the party line. All that might be true, but one doesn't have to agree to have an off-the-record or background discussion with anyone unless one believes in advance that there's a legitimate reason to do so (see David Cay Johnston's refusal to do so with Obama spokespeople here). And even if one does agree to those conditions and the information one then receives doesn't warrant anonymity, the journalist can attempt to persuade the person to agree to have the comments be on the record (and newspaper anonymity policies not only require that such an effort be made, but also require that those efforts be described when using anonymity -- a "rule" that is ignored far more often than adhered to). But the most important point is that journalists are not required to serve as message-carriers. The mere fact that you agree to a "background" discussion doesn't obligate you to then go forth and obediently publish whatever the person on background utters. If all they're doing is trying to inject claims (or "spin") into the public discussion in order to be able to influence or manipulate the debate without accountability (because they're allowed by the journalist to do so anonymously), then the journalist can -- and should -- simply refrain from allowing themselves to be used in that way. There's no value, and there is often great harm, when a journalist passes on false claims or even just "spin" on behalf of a political figure whose identity the journalist is shielding from the public. There are very narrow circumstances in which, virtually everyone agrees, anonymity is warranted -- when genuinely secret information is being revealed or someone is risking something in order to disclose matters of public interest. But far more often than not, that isn't how anonymity is used. Instead, it's typically a weapon wielded by government officials and other politically influential people to use the journalist to disseminate information -- often dubious or outright false information -- to the public while cowardly hiding behind the accountability-free protective shield erected for them by the journalist. Joshua Block, a spokesman for the American Israel Public Affairs Committee, a lobbying group, said Tuesday that his organization had not taken a formal position on Mr. Freeman’s selection and had not lobbied Congress members to oppose it. Yes, Mr. Freeman was referring to Americans who support Israel -- and his statement was a grotesque libel. For the record, the American Israel Public Affairs Committee says that it took no formal position on Mr. Freeman's appointment and undertook no lobbying against him. If there was a campaign, its leaders didn't bother to contact the Post editorial board. Only a few Jewish organizations came out publicly against Freeman's appointment, but a handful of pro-Israeli bloggers and employees of other organizations worked behind the scenes to raise concerns with members of Congress, their staffs and the media. For example, the American Israel Public Affairs Committee (AIPAC), often described as the most influential pro-Israel lobbying group in Washington, "took no position on this matter and did not lobby the Hill on it," spokesman Josh Block said. But Block responded to reporters' questions and provided critical material about Freeman, albeit always on background, meaning his comments could not be attributed to him, according to three journalists who spoke to him. As Ben Smith, Andrew Sullivan, Max Blumenthal and others have already shown, pro-Israel forces were instrumental in turning the Freeman pick into a major controversy. Reporters who covered this closely were subjected to a barrage of info and spin from that camp. Once Freeman was safely vanquished, even some of the lynch mob leaders, like The New Republic's Jonathan Chait, were willing to acknowledge: "Of course I recognize that the Israel lobby is powerful, and was a key element in the pushback against Freeman." Richard Silverstein wrote more than a week ago that "this coordinated attack fits Aipac’s modus operandi to a tee" and also noted the obvious: "This is Aipac laying down a marker, telling Obama that if he wants to stray from the fold on Israel this is what he can expect: war by attrition and death of policy by a thousand paper cuts. The Israel lobby desperately wants to slow down the train that is Obama’s Israel policy." But Jewish and pro-Israel organizations largely decided not to make the fight against Freeman a public crusade, though they were the first, and fiercest, Freeman opponents and made their views known privately. Yet reporters agreed to keep AIPAC's "private" involvement a secret by allowing them to do everything "on background," and -- far worse -- then allowed what they knew to be the false impression to be created that AIPAC had no involvement in the campaign. Instead of the truth, what we have is AIPAC insinuating (through Mark Mazzetti's article) and Fred Hiatt outright stating that Freeman's accusations of AIPAC's involvement are false and deranged -- all because journalists concealed AIPAC's involvement by agreeing to keep it all off the record and therefore pretending it didn't exist. This is what journalistically unwarranted grants of anonymity so often achieve. It isn't merely that these grants of anonymity enable politically powerful individuals and groups to participate in our debates and disseminate information without any accountability whatsoever, though it does do that. Far worse, it causes journalists to become active participants in the dissemination of falsehoods and frauds. When politically powerful people can hide behind anonymity while having journalists disseminate their claims, they have no reason to be truthful because they know that the statements will never be attached to them, and it is thus very often used not to illuminate issues but purposefully to obfuscate and distort them. I don't know how you get out of that cycle. But the judgment I've made is that my readers learn more even when the sourcing is anonymous then they'd learn if I decided to stop talking to officials on principal. It's not the optimal outcome, but it is, as far as I can tell, the best this site can do. But that assumes, wrongly, that anonymous claims are always at least somewhat informative (even if not as informative as on-the-record claims would be). But often, perhaps most often, anonymous claims are the opposite of informative. They're intended to mislead and deceive, which is why the source is unwilling to attach their name to it. Passing those anonymous claims along doesn't help the public understand anything. It deceives the public. I'm not singling out the Freeman/AIPAC episode here nor (as I emphasized) was I singling out Klein or Brooks last week. There's nothing unusual about what happened in the Freeman case. The opposite is true: it's an extremely common, highly illustrative example of how people in Washington use journalists to deceive rather than inform the public, and how journalists -- who love to be the ones who appear to be "on the inside" and in the know and whose careers are helped when they are used this way (because they appear to have scoops and insider insight) -- eagerly grant anonymity to anyone in power who requests it so that they will be chosen for similar mission-carrying, career-aiding tasks in the future. It's a dirty, synergistic dynamic which helps the source and the reporter and harms and misleads the public. Justified anonymity is a vital tool for exposing government secrets and other forms of wrongdoing, but baseless grants of anonymity by journalists -- as the Bush era conclusively proved -- is the bond that keeps reporters and the politically powerful working in sync rather than adversarially, often with highly misleading and deceitful effects. That sort of anonymity is just another instrument used to shield the operations of the Beltway from scrutiny and public disclosure, and is the fuel that drives the incestuous, cooperative government-media monster. The accusation that Charles Freeman is some sort of raving paranoid for suggesting that AIPAC was behind these attacks on him -- a smear accomplished only by allowing AIPAC to do its dirty work behind the secrecy which journalists granted them -- is a perfect illustration of how severely this process can distort the truth. One last point on Freeman: it's certainly true that some of the objections to Freeman had nothing to do with Israel and were motivated by claims that he was too close to the Saudi government or too soft on the Chinese, though is there anyone -- anywhere -- who believes that the controversy over a relatively obscure appointment of this type, not subject to Senate confirmation, would have received anything approaching this level of attention without Freeman's criticisms of Israel driving it? 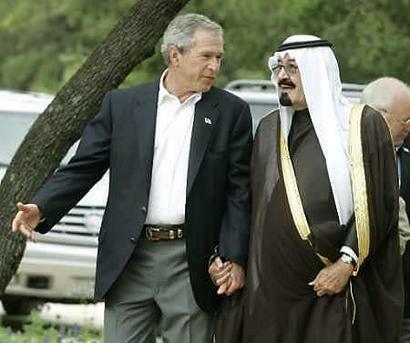 More to the point: since when does closeness to Saudi Arabia disqualify someone from political office? Who in the U.S. Government advocates breaking off or even weakening our alliance with the Saudis? In Washington, close U.S.-Saudi ties are almost as much of an unchallenged political orthodoxy as U.S.-Israel ties, and it's been that way for decades. Does anyone remember this or this? Freeman was head of an organization that received miniscule amounts of funding from Saudi Arabia, an organization from which Freeman received a small salary. Compared to the involvement with the Saudis of the Bush family, which ran the country for many years -- or even the financial ties to foreign countries on the part of the Clintons, one of whom currently runs the entire U.S. State Department -- Freeman's supposed financial ties to Saudi Arabia is dwarfed by many magnitudes. And if ties to Middle Eastern countries disqualified people from holding high political office, we wouldn't know the names Doug Feith or Elliot Abrams or Dennis Ross or even Rahm Emanuel. Finally, the idea that the U.S. should maintain close relations with the Saudis isn't a fringe position; in fact, I can't think of anyone in high political office, now or in the prior administration, who argued otherwise. And, for that matter, was there anyone in the Bush administration and is there anyone in the Obama administration who actually wants to take action against the Chinese -- our omnipotent bankers -- to punish them for their human rights violations or otherwise force them to change behavior? Freeman's comment on a private listserv about Tiananmen Square was certainly worthy of criticism (though see Dan Larison's second update here on the actual context of the remark), but the notion that his general views on and connections to the Saudis or Chinese is something unusual for Washington isn't even a serious argument. It's pure pretext to disguise what this controversy was about. UPDATE: In the New York Times this morning, Mazzetti, writing with Helene Cooper, has a much better, more thorough article on the Freeman controversy, with this headline: "Israel Stance Was Undoing of Nominee for Intelligence Post." It quotes Chuck Schumer as accusing Freeman of "irrational hatred of Israel." The Freeman controversy, they write, raises the question of whether it is "possible to question American support for Israel without being either muzzled or marginalized," and quotes Robert Jordan, a former U.S. Ambassador to Saudi Arabia, as saying (with great diplomatic understatement): "The reality of Washington is that our political landscape finds it difficult to assimilate any criticism of any segment of the Israeli leadership." Just to underscore how respected of a diplomat and civil servant Freeman was in mainstream political circles in Washington, David Broder -- the ultimate face of the Washington establishment -- today lambasts Freeman critics and begins his column this way: "The Obama administration has just suffered an embarrassing defeat at the hands of the lobbyists the president vowed to keep in their place." Is Fred Hiatt going to accuse Mazzetti, Cooper, Broder and Pincus of advancing "crackpot theories" and "grotesque libels" for pointing out the driving forces behind the attacks on Freeman? This may be a case where the Israel-devoted Right overplayed their hand to obtain a short-term victory at the expense of long-term damage to their cause. Freeman is widely admired in many influential intelligence and diplomatic circles in Washington, which are clearly angry about the ugly character smears directed at him. Has there ever been an occasion where the taboos suffocating our debates over Israel and the vast influence wielded by AIPAC and others over America's Middle East policies have been so openly discussed and widely debated in mainstream publications? The chair of the National Intelligence Council, Chas Freeman, steps down. That's a huge loss for a country that needs someone like him to push the envelope on its dangerously narrow foreign policy debate. . . .
Freeman said in a statement he issued last night that the fire had come mostly from the pro-Israel lobby, which didn't like his views on the Middle East, and I suspect that's probably true. This reflects a disturbing fact about Washington: in foreign policy discussions, the range of permissible debate often stretches from A to B . . . . There is a correct line which is enforced by lobbies of various descriptions, and administrations jump that line at their risk, as the Obama administration seems to have decided yesterday. . . . It illustrates this fundamental and disturbing fact, that on many issues -- the Middle East is one, but there are many -- the range of permissible debate is too narrow for a country as powerful as the United States. It looks like Ignatius is another person to add to the Washington Post Editorial Page's growing list of those who spout "grotesque libels" and "crackpot theories," as Ignatius endorses Freeman's accusation that "the fire had come mostly from the pro-Israel lobby."